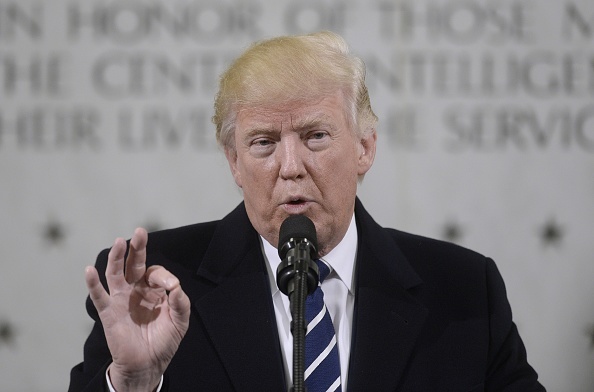 LANGLEY, VA – JANUARY 21: US President Donald Trump speaks at the CIA headquarters on January 21, 2017 in Langley, Virginia. Trump spoke with about 300 people in his first official visit with a government agency. 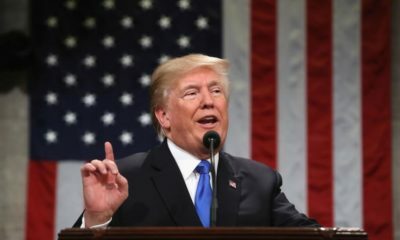 President Donald Trump of the U.S. has told the Central Intelligence Agency (CIA) that it is time to “eradicate the Islamic State (ISIL) terrorist group from the face of the earth”. Trump, made the remarks at the CIA headquarters on his first full day in the office. He also told the intelligence agencies that he was not against them. He promised to ensure that radical militant groups are are crushed wherever they are. 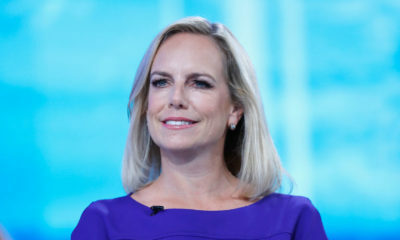 The president, who has had public disagreements with the intelligence community, particularly for releasing damaging reports against him about Russian involvement in the hacking of emails belonging to the Democratic Party, was always on Twitter attacking the leadership of the agencies. According to him, his visit was prompted by the media reports portraying him as having a negative view about the CIA. “As you know, I have a running war with the media because they make it look as if I have a feud with the intelligence agencies. I used to call them ‘dishonest media’ but they did a fantastic job covering my inauguration yesterday. The reason you (CIA) are my first stop is because of the media because they are the most dishonest people. They make you feel that I hate the intelligence people,” Trump said. He also denied reports that he removed the statute of the civil rights icon Martin Luther King Jr. from the White House, and blamed the U.S. media for what he called “dishonest reports”. “I love honesty and I want people to report me honestly,” he said. Trump, who turns 71 next June, also described himself as “young”. Trump, who is facing massive protests from women’s groups and civil rights activists across the country and the world, over his utterances during the campaigns and his policy announcements particularly over minority and immigrants rights, however, did not make any remarks to defuse the protests. The turnout at anti-Trump marches across the country exceeded the estimation of the organisers who particularly declared that it was no longer possible for the Washington rally to march to the White House because of the unprecedented attendance. @dee, pls, don’t fall for this misinformation. the full meaning of CIA is still Central Intelligence Agency. Their website is http://www.cia.gov ———– I wonder where BN got Criminal Investigative Agency from. Oh dee – you are right. As usual, BN is wrong. Copying and pasting the error because when they change it someone will say but it says Central Intelligence Agency. The editor and proof readers are still sleeping on the job ? I honestly can’t even believe BN. It’s not like they’re a small blog. It’s annoying when I notice something off every single article I read. It’s just silly and careless. By the way, Trump can like to add BH and F. Herdsmen to the list since the Nigerian government doesn’t seem to know what to do with them. You are right. The mistake is from the writer. This Bufoon thinks the CIA has been drinking garri and just watching ISIL do what they want abi? They are working on how to eradicate ISIL without bring a war to the United States. This Ode POTUS thinks this is a movie abi? Quoting speeches from a cartoon(the Bee movie) and an action hero movie villain (Bane from Batman) does not make you a good commander in chief definitely not a smart one! This man-child , this people elected. Eradicate a group based on an Ideology? An Isil member can be a caucasian born and bred in the USA, please how do you eradicate such? The idea is in the person’s head!!! Ok now,let’s see how you eradicate them!maybe you think the CIA have been sleeping..disrespectful man.